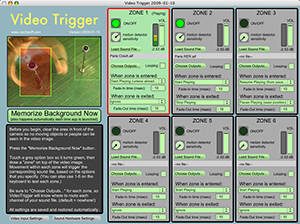 Video Trigger is a free standalone motion detector application tailored for media artists. Attach a camera and trigger sounds whenever occupancy is detected in six user-defined areas of the video image. You have complete control over the playback logic and signal routing. Surround is supported, and the source patches are included. I'm gonna try it ! Great piece of code ! Easy to understand, easily adaptable… Very powerful and useful. Thanks for sharing ! Thanks. Nicolas. I'm glad it helped you out. Great! It's exactly what i was looking for! Maurizio.